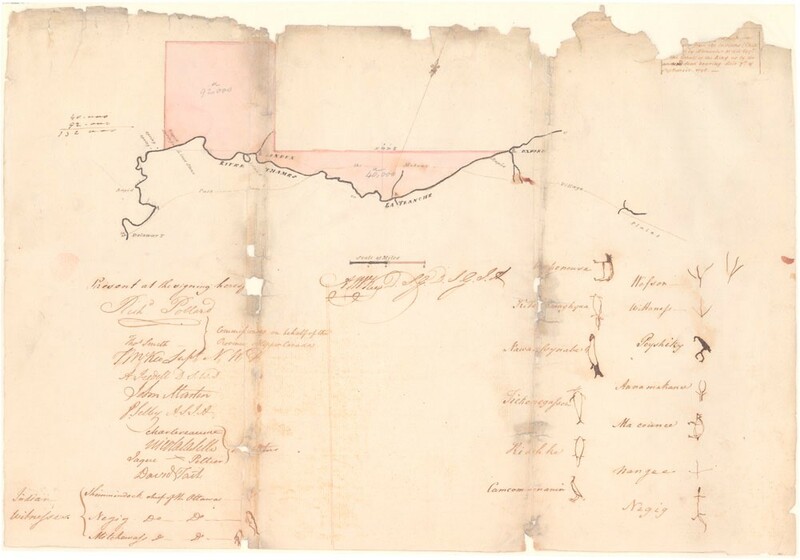 Source: Deed of the Sale of lands on the North side of the River Thames or La Tranche in Upper Canada from the Chippewa Nation to Alexander McKee – LAC, RG10, vol. 1840, IT 021, p. 1.
thence down the said River Thames following the several winding and courses with the stream to the place of beginning. To have and to hold the said parcel or tract of land together with all the woods and waters thereon situate lying, and being unto the said Alexander McKee, Esquire, for and on behalf of His said Britannic Majesty King George the Third His heirs and successors for ever free and clean of and from all claims, rights, privileges, or emoluments which we the said Chiefs, Warriors and People of the said Chippawa Nation might have before the execution of these presents, and free and clear of any pretended claim which our children or descendants may hereafter make the same, hereby renouncing and forever absolving ourselves, our children, descendents and posterity of all title to the said parcel or tract of land, the soil, wood, and waters thereof, in favour of the said Alexander McKee, Esquire, for and on behalf of His said Britannic Majesty, His heirs and successors for ever. 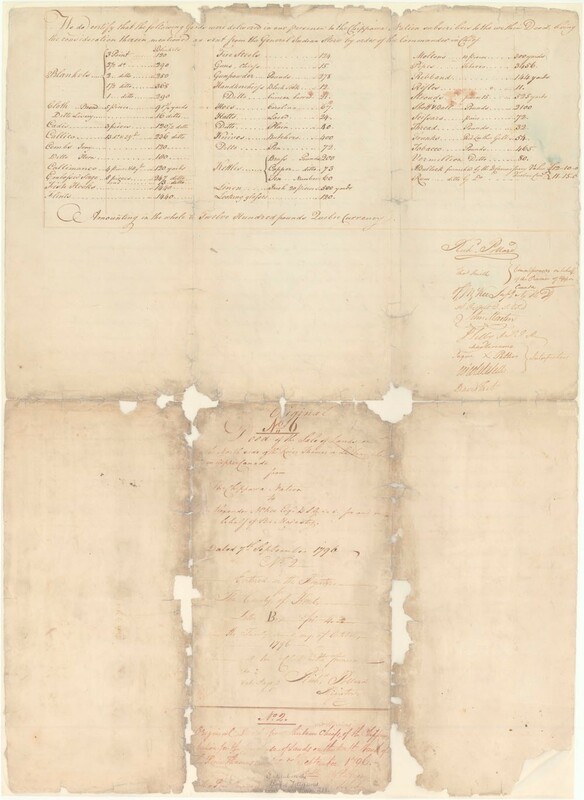 Source: Deed of the Sale of lands on the North side of the River Thames or La Tranche in Upper Canada from the Chippewa Nation to Alexander McKee – LAC, RG10, vol. 1840, IT 021, p. 2. 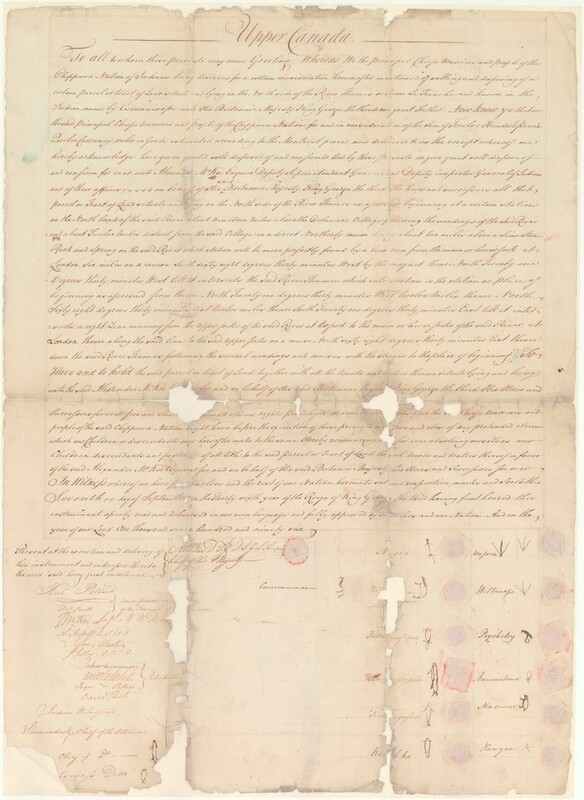 Document 8: London Township Treaty (1796) by Sean Kheraj and Tom Peace is licensed under a Creative Commons Attribution-NonCommercial-ShareAlike 4.0 International License, except where otherwise noted.